The Alesis SamplePad 4 is a four–pad sample–triggering instrument designed primarily for drummers and percussionists. Though smaller than a typical laptop computer, it has four sensibly sized rubber pads — two square and two presented as raised bars — with blue ‘cruising’ lights underneath to help guide your aim when the venue lights go out. Threaded points in the base allow an optional stand mount to be fitted, and there’s a dual–trigger input jack, allowing you to attach a kick pedal or additional pads. In addition to the 10 preset drum kits on offer, which feature various combinations of the 25 on–board samples, you can also load in your own samples via an SD/SDHC card slot. The SamplePad 4 accommodates cards up to 32GB in size, though the maximum capacity of 89 user kits and 512 samples per card may mean you can get away with one much smaller. Connect the SamplePad 4 to a Mac or PC using the USB 2 port — which also functions as a USB MIDI output — and you can drag and drop samples onto the SD card from your desktop. Once loaded, samples can be retuned and treated with the built–in reverb effect. Navigation is accomplished via four cursor buttons and a small, back–lit LCD window. Pressing two of the buttons at the same time brings up the Option and Save dialogues; Option provides access to a lot of ‘under–the–hood’ global settings, including adjustment of the response curves for the pads. You also need to visit this menu for importing new sampled sounds via USB or for changing the MIDI channel. Separate level controls are provided for the main output and a headphone output. The main output is stereo, on two quarter–inch jacks, while the stereo headphone ouput uses a single quarter–inch TRS jack socket. Inevitably, power comes from an external adaptor with the usual pedal–style push–in connector. The pads can be played using sticks or your hands, but one thing I realised within the first 30 seconds of using the SamplePad 4 is that, if you play it with the flats of your hands, it’s very difficult to avoid hitting the cursor buttons and changing the drum kit. Playing using your fingertips rather than palms is safer. The menu system is easy to follow. Tapping a pad selects it for editing, and the cursor up/down buttons select either the kit or the parameters for the last pad you hit. In kit mode the left/right cursor buttons move through the kits. If a pad parameter is selected, they change the values for the sound assigned to the pad. Here you can set tuning, panning, reverb level, pad level, sensitivity, trigger mode and mute group, as well as the MIDI note the pad will output over USB. Tap another pad and you can adjust the selected parameter for that pad, which provides a very easy way of setting up levels and sensitivities without too much menu trawling. The maximum sensitivity setting is ideal for playing with fingertips while the default sensitivity is fine for sticks. Usefully, the pads are velocity sensitive so you can assign two sounds per pad with velocity switching, but only if you are using samples from the optional SD card. You can set a velocity range for each sample so they can overlap if required. User samples must be stored in the root directory, not in a folder, in WAV format with 16–bit resolution, on a card formatted for the FAT32 file system. Sample names can be up to eight characters long with no spaces, and certain characters are excluded, so sticking to letters is best. Sample rates of 48, 44.1, 32, 22.05 and 11.025 kHz are supported. In practice, importing sounds turns out to be a relatively smooth process. Once a sound is selected from the card it takes a few seconds to load into the pad, and when you’ve filled all your pads with suitable sounds and set the parameters as you want them, you can save the kit. 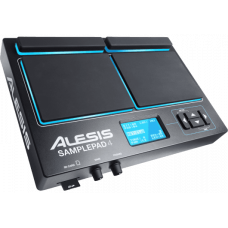 The SamplePad 4’s rear panel features a headphone output, a power button PSU input, a trigger input socket, a pair of audio outputs and a USB port. All audio connections are on quarter–inch jack sockets. It’s worth looking more closely at the pad trigger modes as there are several options. Polyphonic mode means that triggering the pad a second time won’t kill the first sample, so the sounds will overlap. Alternatively, you can select Mono mode if you want the second hit to kill the first. Loop mode means the sample will keep repeating until you hit the pad again, useful if that pad is triggering a phrase. A pad can also be set to Stop to terminate all playback from all pads. Tempo mode allows you to set the internal metronome speed from a pad by striking it several times, while Clock starts and stops the metronome ‘click’, which can be set to claves, sticks, cowbell or a beep. The Mute Groups feature is another useful addition, allowing a sample playing on one pad to be terminated when another pad in the same group is hit — particularly useful if you have, say, synth pad chords on the different pads. You could also set up a mute group for open and closed hi–hat sounds so the closed hat cuts off the open one. The sounds provided as presets are mainly kicks, snares and assorted percussion, including shakers, congas, claps, cowbells and wind chimes. If you want toms or cymbals, you’ll need to use an SD card and import your own. Fortunately, there’s a large free library of both hits and loops on the Alesis web site to get you started. I also quite like the idea of importing some cajon samples, as having four pads with velocity switching samples assigned to them would provide a useful range of sounds. Just turn up with a laptop case, DI into the PA and you are good to go. While having a maximum of two velocity layers won’t replace one of the ‘big gun’ software drum kits, the velocity sensitivity of the pads is often all you need for an effective live performance. Ideally I would have liked to see a software editor for configuring kits, but in reality the menu system is pretty friendly. As a hand percussion instrument or an add–on to an existing drum kit, the SamplePad 4 does a pretty good job at an affordable price and without unnecessary complication.